What information can be searched? A database of experts in their field from each of the participating research organizations. A collection of publications (journal articles, conference proceedings and book chapters) published by the Experts held in the database. Published patents where one of the assignees is in Ohio. Highlighted patents of participating research organizations. Research-related equipment and services held at institutions within Ohio. While using OIEx, the Search box is always on the page. On the homepage, you’ll find it in the center of the page. On each other page, the search box can be found at the top of the page in the center. You can start a new search from any page – just type your terms into the box and hit Enter. Searching is not case sensitive, and each search will simultaneously bring back search results in all data sources (experts, publications, patents, featured patents and equipment). Clicking on each of these headings will then give you the list of results for that data source below. What kind of searches are supported? Example: searching for thoracic spine will return results with both thoracic and spine in the text. Example: "thoracic spine" will return results only where the terms thoracic and spine appear next to each other and in that order. Example: thoracic AND spine will return articles which contain thoracic and spine. Example: thor* will return result terms which have words which begin with thor , such as thoracic, thorn, etc. Note: ​NOT​ searches are not supported in the tool. What is relevance in the tool, and how is it calculated? The relevance tool tracks how many times a term is found in a document. When terms are found multiple times, the document is considered more relevant to the search. Also, if the keywords appear in the title of a publication they will be given more relevance than when found in the abstract only. Do I need to register for a log-in to use the OIEX search? What is the benefit if I do register? Gain access to worldwide linked database research tools: ​Dimensions​, and Readcube​, the pdf management and reference tool, both from our partners Digital Science​. What information is available in the search page? 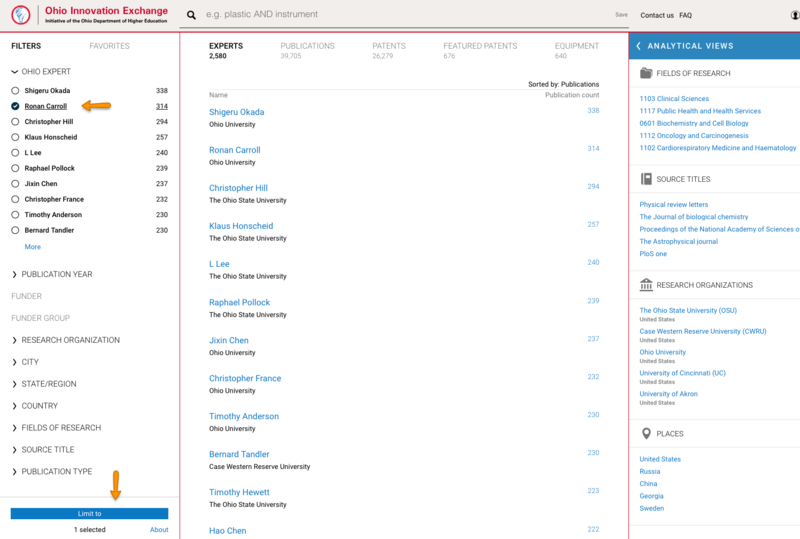 The search page includes three sections: a results section in the center; a filter panel on the left, and an analytical view panel on the right. How do I conduct a single search by university of expert? You can refine and filter your search results by using filters on the left side of the search page. Each filter shows the top ten entities for that filter, sorted by the number of results in the present search. If the entity you are looking for is not among the first ten, you can use the more button at the bottom of the list to type the name of the entity you are looking for. This type-ahead function will then bring up a selection of possible matches for your search. The Analytical Views area displays a range of different lists and visualizations of the results. The name of any entity in this area, such as a ​Journal or Researcher​ , can be clicked to add that entity as another filter for the search. A search filtered by a specific researcher/expert. A search filtered by a specific source title. Yes, if you have logged in with a user account, the Save functionality is available. What are Altmetric mentions ? 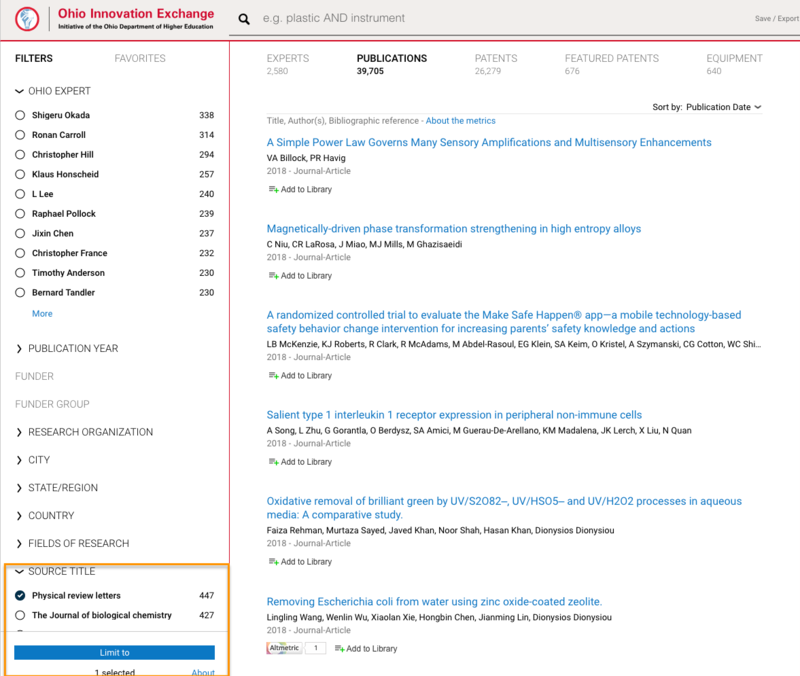 Altmetric mentions show where research has been mentioned or discussed in social media, such as news articles, blogs, tweets, policy papers, etc. This information can be seen on the OIEx platform Expert page where results are collated by person. The Altmetric badge in publication searches indicate the level of attention. You can click on the badge links to view more details about this attention. This function and data is collated by Altmetric, part of Digital Science. For more information please visit ​www.altmetric.com​. The location of the Altmetric badge in a search result. What are the Citations buttons, and where does this information come from? What are the Add to library buttons, and how do they work? The Citations badge, or Dimensions badge can be seen on the publications results list as well as any publications page. This badge shows how many times a publication has been cited by others with additional metrics. You can click on the badge links to view more details about the citations. The location of the Citations badge in a search result. What are the Add to library buttons, and how do they work? The ​ Add to library buttons are displayed in the publication results list and pages. These buttons allow you to add the publication to your Readcube library. When publications are added to the library, the button will display, In Library . You can then click on this to open the Readcube library in a new window. Registering for a login to the OIEx platform automatically generates an account for Readcube. For more information about Readcube, please see www.readcube.com​. What is Dimensions, and how does it relate to the OIEx platform?